1. Students will reflect on our new President by creating a quick POWERPOINT. 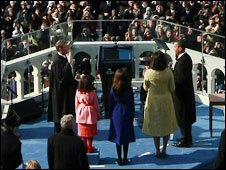 Yesterday was INAUGURATION DAY 2009. It was extra-special because we ushered in our first AFRICAN american President. Along with your letter, include at least 3 Pictures to illustrate your opinion and points.